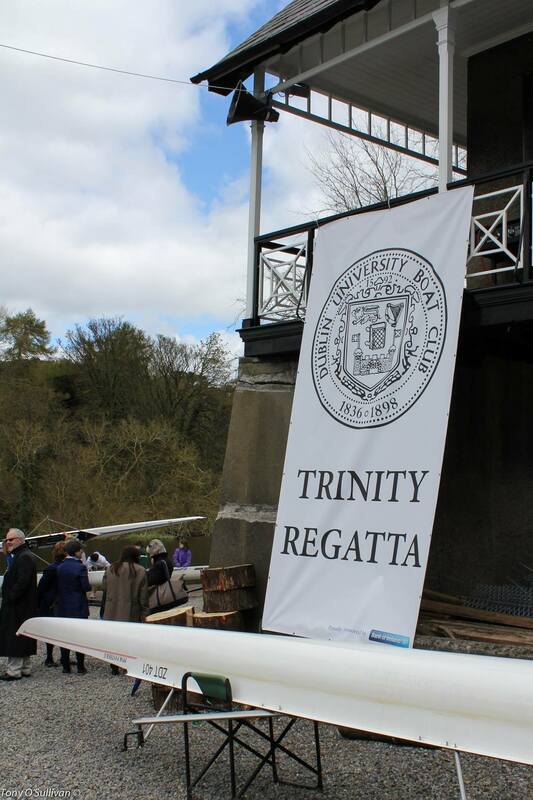 The Sesquicentenary Trinity Regatta was held at Islandbridge on April 16 th . The regatta, which marked 150 years since DURC first held a regatta in 1866, was well attended. 259 crews from 24 clubs raced over 14 hours, necessitating some heats to be raced on Friday evening. A large junior entry was supplemented by a good entry in the Senior VIIIs events. The Women’s Senior VIII was won by DULBC, seeing off KSRV “Njord” in the final. KSRV “Njord” had earlier progressed through the semi-finals after UCDLBC was disqualified for crossing lanes. In the Men’s Senior VIII, UCDBC won the final against DUBC, with Commercial RC and KSRV “Njord” both being knocked out in the semi-finals. The Regatta saw many other good races throughout the day, at all levels. One race of particular note was the private match race between An Garda Síochána and the Defence Forces. It has been some years since this historic match was held, and after much speculation as to who was now the dominant rowing force, the Defence Forces beat An Garda Síochána in a hard fought race. Rowing aside, the weather, which was cold but sunny, allowed spectators to enjoy their day out in the park. The marquee which had to provide shelter from the odd shower, was also home to Christophe’s Café all day, and a jazz band throughout the afternoon. Senior 8 and Junior 8 of 1966 and also of the Senior 8 of 1976 were in attendance. The centrepiece, literally, at the Luncheon was the Arthur Guinness Trophy; a large crystal trophy commissioned for the Centenary Trinity Regatta half a century ago. The trophy was won by GSBC in 1966, and it has been in their keeping since. Its presence, on loan for the Luncheon, was a cause for much excitement, particularly for those who recall it being presented 50 years ago. Following the prize-giving, Regatta Supper was served to 90 competitors in the boathouse. The Dutch visitors from Leiden joined members of DUBC, DULBC and some other local clubs for a meal, some Dutch Gin, and of course Guinness. After months of planning, 172 races raced, and 246 medals won, the Sesquicentenary Trinity Regatta drew to a close with an enjoyable evening of merriment in the bar. After a century and a half, this year it was shown that Trinity Regatta can still provide for great racing, and an enjoyable social day out for all. Here’s to the next 150 years!